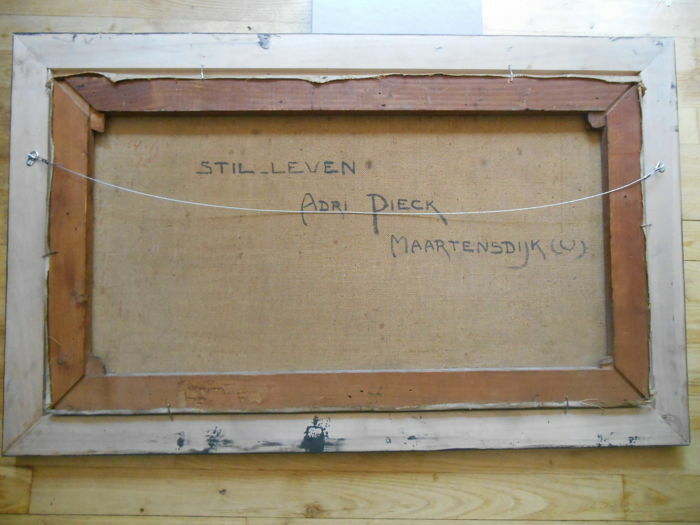 Adriana Jacoba Pieck came from a family with four daughters. The family was a model of deeply felt Christian humanism. There was also a great respect for nature, for everything that lives and flourishes in it. Adri was a vegetarian and also strongly opposed to vivisection. Soon it appeared that she, together with her youngest sister Gretha, had a lot of talent for drawing. Gretha died of the Spanish flu at a young age. 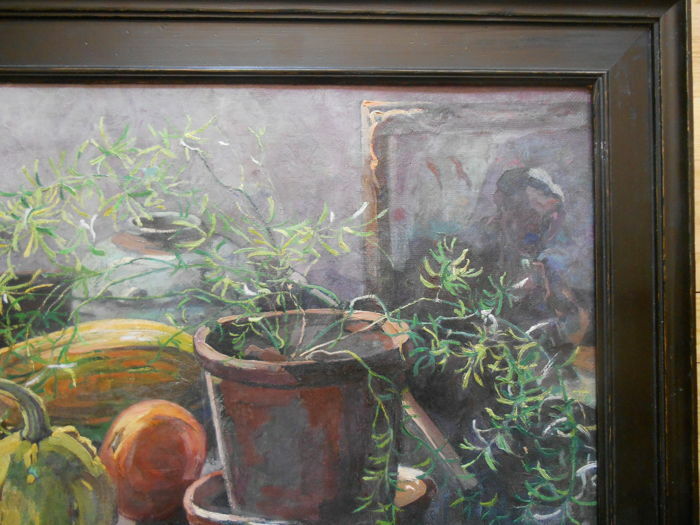 Adri attended the Rijksacademie in Amsterdam from 1909 to 1911. 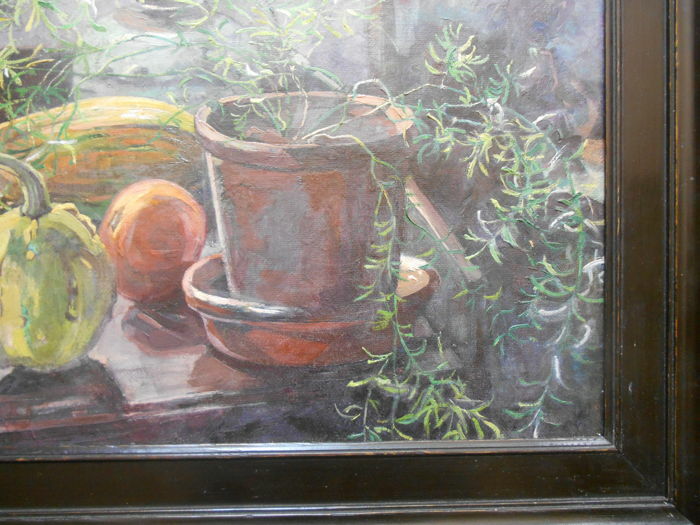 She was also taught by the Laren landscape painter W.A. Knip. She was certainly also influenced by van Gogh. 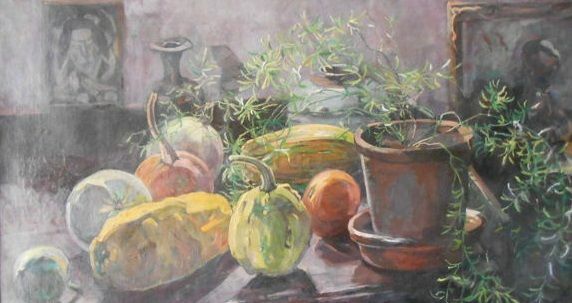 This is reflected in the clean lines and the colourful palette in many of her paintings. She developed her own style and especially nature in all its facets was a source of inspiration. 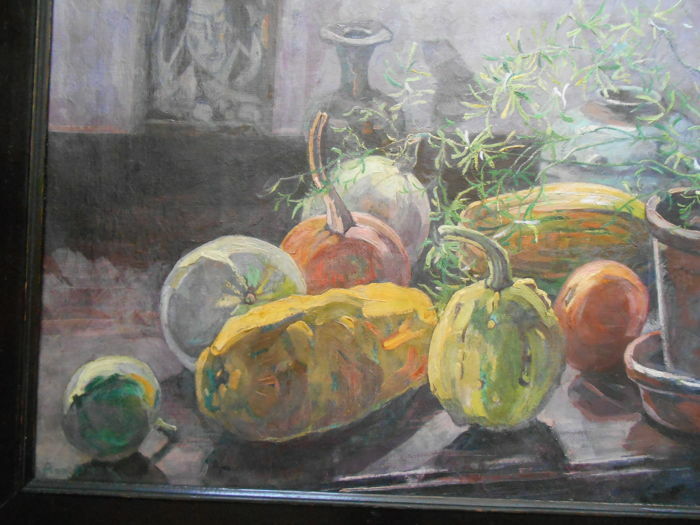 We see a beautiful still life with gourds. 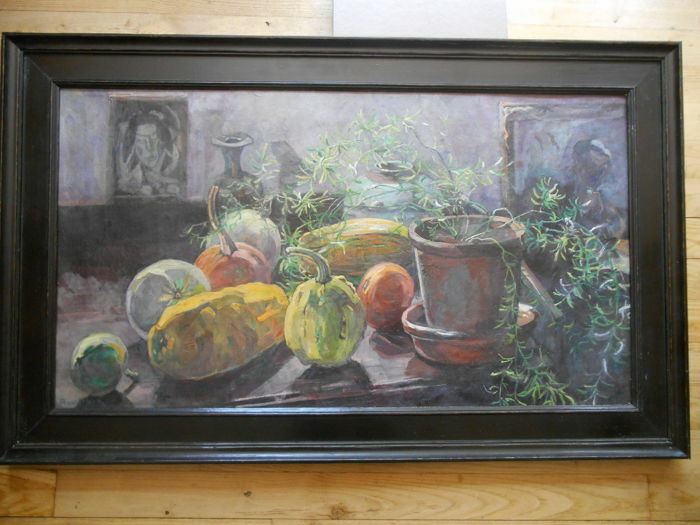 Remarkable are the characteristic colours of her work reseda green and a lilac-like hue in the background. 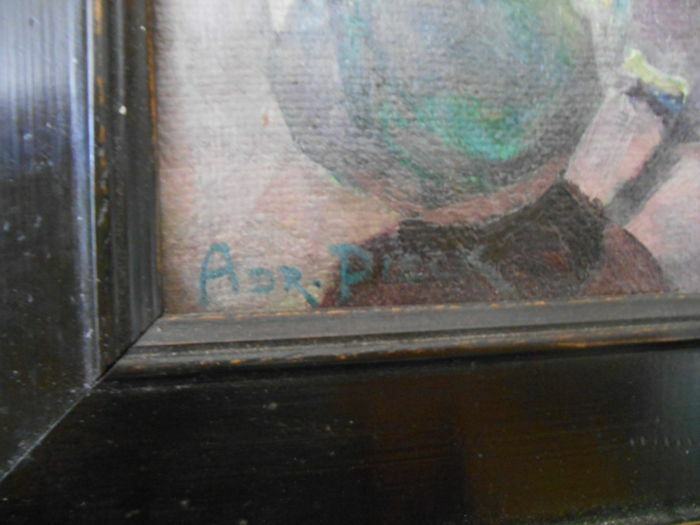 The painting is in very good condition. Shipping is possible in consultation, only in the Netherlands. Shipping costs are for the buyer. May also be picked up, of course. Het schilderij is op zichzelf wel mooi, maar valt donkerder uit dan in de advertentie. Dat is wel jammer. Jammer dat u ietwat teleurgesteld bent. Alle foto's worden genomen zonder flitslicht en zonder lampen. Wel maken we optimaal gebruik van zonlicht door in de woonkamer te fotograferen vlakbij het buitenraam. 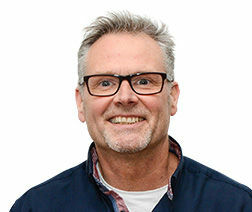 Natuurlijk kan er verschil zijn tussen de "werkelijkheid" en de foto. 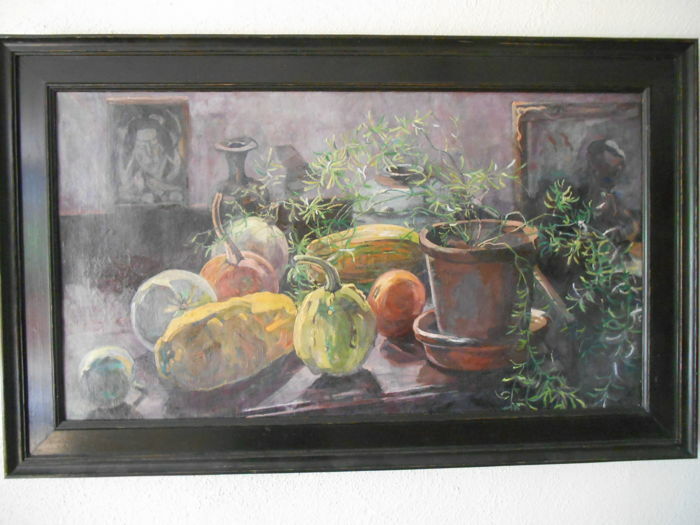 Due to the size or fragility of this lot, the seller requires it to be picked up from Hollandsche rading (Netherlands).